ATSB’s Final Search Area Completed. Once Again, MH370 Isn’t There. 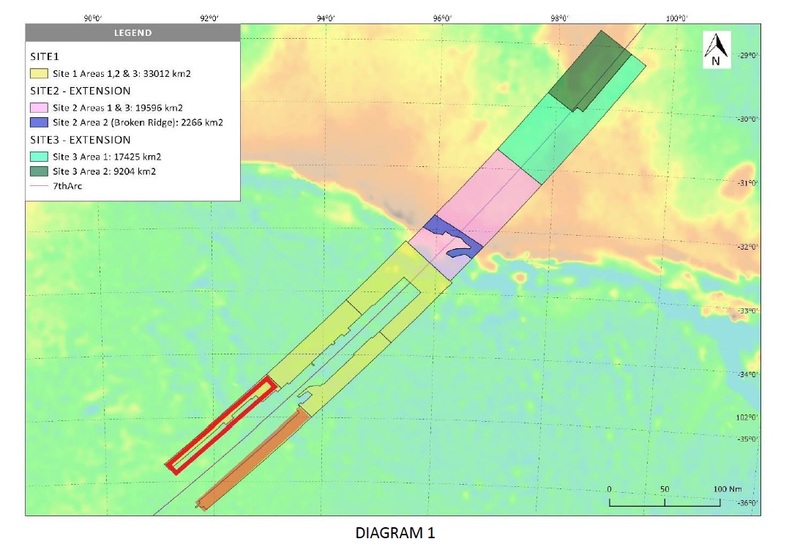 Earlier today Malaysia released its latest weekly report into the progress of Ocean Infinity’s seabed search in the Southern Indian Ocean for the wreckage of MH370. Included was the chart above, which shows the area currently being scanned in red. The southernmost portion of this “T” shape is that last part of the 25,000 square kilometer designed by the ATSB as the final search area. Once it is scanned and the data assessed, the search will be over. Or rather, the statement above should be in the past tense, because the last weekly report showed this small area as already having been scanned. Thus, the ATSB’s final 25,000 square kilometers has already been finished. a remaining area of high probability between latitudes 32.5°S and 36°S along the 7th arc. 4. 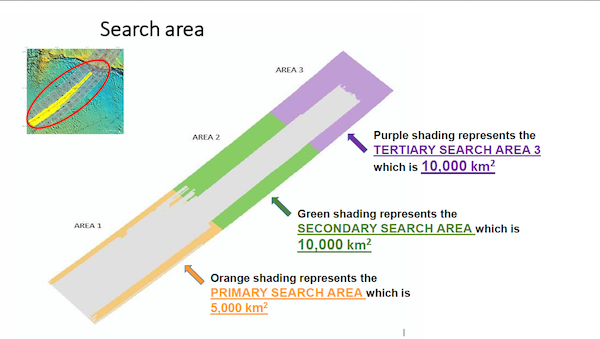 The participants of the First Principles Review were in agreement on the need to search an additional area representing approximately 25,000 km² (the orange bordered area in Figure 14) [I’ve added this figure to the bottom of this post–JW]. Based on the analysis to date, completion of this area would exhaust all prospective areas for the presence of MH370. If anyone thinks I am hasty in saying that Seabed Constructor has finished its scan of this area, note that as I write, the ship continues to work northwards well beyond this area. If MH370 had already been found, it would not be doing so. The designation of the 25,000 square kilometers marked the fourth time that the ATSB has assured the public that it had identified the area where the plane had come to rest. Each of the last three times, it was proven wrong and been forced to designate a new place to look. Today, that game ends. The ATSB has admitted that has no further analytical basis on which to recommend any further search. It’s out of ideas. It has thrown in the towel. It is out of ideas. To be sure, there are some bitter enders among the “MHiste” community who have come up with reasons for searching further beyond the ATSB’s final 25,000 square kilometers, but their theories now lack any official backing, and to my eye are nothing more than hand-waving based on an inability to admit to being wrong. Seabed Constructor sails on like a headless chicken, with no rational basis for continuing to search. The ATSB’s search areas were defined using data exchanged between the plane and Inmarsat in the hours after the plane disappeared from radar. Their analysis was quite sophisticated; if the data had been authentic, the odds were tremendously in favor of the plane being found. But the plane was not found. Was this because of an incredible coincidence/bad luck on the part of the ATSB? Or is the case rather that whoever took the plane played them for suckers? The bitter enders believe that they and the ATSB were the victims of bad luck. The pilot (most likely) took the plane and flew south, but happened to fly in some weird way that by chance produced data that looked very much like what a normally flown plane would produce. This being the case, the plane must be somewhere in the vicinity. The other explanation is that they weren’t unlucky. They were fooled. By perpetrators who, based on their behavior before disappearing from radar, were both sophisticated and had every intention of misleading and deceiving. Who went electronically dark and pulled a 180 just six seconds after passing the last waypoint in Malaysian airspace, and had the electrical engineering chops to first turn off, then turn back on the satellite data unit that ultimately produced the clues that the seabed search would be based on. The Inmarsat satellite data unit logs were made publicly available at a very early stage of the investigation and the data has been reviewed frequently by the Joint Investigation Team convened by the Malaysian Government comprising experts from the People’s Republic of China, France, Malaysia, United Kingdom, United States and Malaysian Government officials. Does this explanation justify confidence in the data? I don’t see it. Over on other blogs, self-appointed experts will continue to spin out elaborate theories and crunch the numbers to generate new convoluted flight paths. They will tell you that the mystery is incredibly complicated and only the truly erudite come hope to plumb its complexities. Actually, the truth looks quite simple to me. The perpetrators of MH370 set out to baffle and confuse, and they succeeded beyond measure. They have played the ATSB and its fan boys for chumps, and will continue to do so. Game, set, match. UPDATE: Within minutes of my tweeting about this post, Mike Exner laid into me, calling me all sorts of bad names, and saying that Seabed Constructor had lots of high-probability square kilometerage ahead of it. I responded that if he is so confident of the high quality of the area left to search, then he should be willing to make a bet with me: If Seabed Constructor finds MH370’s wreckage in the months to come, I will publicly acknowledge that he was right all along and I was wrong. And if it does not, he will do the same for me. Posted on April 3, 2018 April 18, 2018 Author Jeff WiseCategories Aviation162 Comments on ATSB’s Final Search Area Completed. Once Again, MH370 Isn’t There. 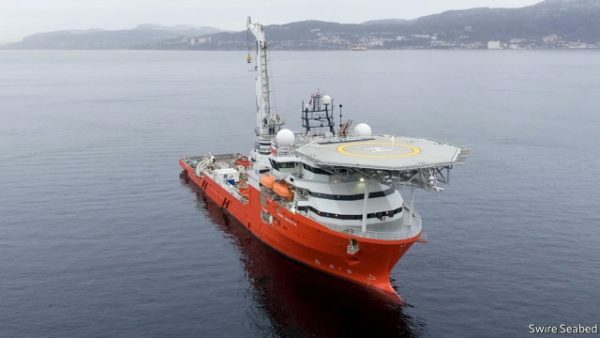 Experts from all over the world have converged in Perth, Australia, to meet Seabed Constructor, the exploration vessel tasked with finding the wreckage of MH370, after its first stint in the search area. Technical experts and government officials are having meetings and dinners, touring the ship, and doing photo ops. Everything glitters and spirits are high. Lost in this excited hubub is the fact that the latest search effort has already invalidated the expert analysis that got it launched in the first place. The wording is important, because as the original search area was winding down, Australia, China and Malaysia said that it would only be extended if “credible new information” came to light. The CSIRO’s language sounded like an attempt to make the case that this condition had been met. And indeed, the three specified points were all included the “Primary Search Area” that Seabed Constructor recently focused its efforts on. However, that area has now been searched. And once again, the plane was not where it was supposed to be. The CSIRO’s “unprecedented precision and certainty” was a mirage. How is that, time and time again, officials heading up the search for MH370 exude great confidence and then come up empty handed? How can we account for four years of relentless failure? The answer, it seems to me, is quite simple. Investigators have resolutely failed to grapple with the single most salient clue: The fact that the Satellite Data Unit (SDU) was rebooted. This electronic component is the part of the 777’s sat com system that generated the Inmarsat data that has been the basis of the entire search. There is no known way that it could accidentally turn off and back on again. If one has no idea how the SDU turned on, then one can have no confidence in the integrity of the data that it generated. The ATSB has never publicly expressed a theory about what could have caused the reboot, except to say that most likely the power had been turned off and back on again. There was always the possibility that, behind the scenes, they had figured out a way that this could plausibly happen other than being deliberately tampered with. One might forgive the expenditure of vast wealth and manpower based on data of dubious provenance if there was other evidence that independently supported it. But the contrary is the case: debris collected in the western Indian Ocean shows no signs of having drifted from the search zone, as I wrote in my previous post. It is increasingly clear that the plane did not go where the Inmarsat data suggests it did. The fishiness of the Inmarsat data, and the fishiness of the SDU reboot that created it, are all of a piece. Soon, Seabed Constructor will return to the search area; some weeks or months after that, it will leave again, empty handed. When it does, people all over the world will ask: How could they have failed yet again? The answer will be simple. It is this: Investigators never established the provenance of the evidence that they based their search on. The essence of the mystery of MH370 is this: was the missing Malaysian airliner hijacked by a suicidal pilot and flown into the remote southern Indian Ocean, or did it fall victim to sophisticated hijackers who spoofed its satcom satellite signal to fool investigators into looking in the wrong place? To resolve the issue we have two sets of clues. The first is the aforementioned satellite signal data, better known as the Inmarsat BFO and BTO data. The second is the collection of 20-odd pieces of debris collected in the western Indian Ocean from July, 2015 onwards. Using advanced mathematical methods, its possible to derive a probability distribution from the Inmarsat data showing where the plane might have wound up, assuming the data had not been spoofed. Under the leadership of the Australia Transport Safety Board (ATSB) more than $150 million has been spent searching this area, and the plane was not there. This suggests that the data was spoofed. A further area where some mathematics suggest the plane might possibly have wound up is currently being searched. If the plane is not there, either, then this will lend further weight to the conclusion that the data was spoofed. Examination of the debris provides an avenue to independently check this conclusion. Debris which floats across oceans collects a wide variety of marine organisms as it travels, allowing scientists to understand how long it has been in the water and where it has traveled from, as I’ve written about previously. Aircraft wreckage which entered the water in the eastern part of the Indian Ocean as a result of a crash on March 8, 2014 should for the most part be richly covered in a variety of organisms. However, this was not observed; most of the pieces had little or no visible biofouling. Another anomaly regarding the biofouling of the flaperon was the fact that during flotation tests, the flaperon was found to float about half out of the water. This is difficult to reconcile with the settlement pattern of Lepas, which cover every part of the item. Since Lepas only attach and thrive under water, this suggests that the flaperon did not float freely during its time in the water. A third anomaly was the finding, based on the chemical composition of the shell, that the Lepas growing on the flaperon spent much of their lives in water that was between 18 and 20 degrees. It would not have been possible for the flaperon to float from such distant, cold water to its time and place of discovery by natural means. Australia’s final report also included analysis of the biofouling of debris. Scientists at Geoscience Australia scrutinized four pieces: the flap fairing found by Liam Lötter in Mozambique (designated Item 2), the fragment of horizontal stabilizer with the words “No Step” found by Blaine Alan Gibson in Mozambique (Item 3), the piece of engine cowling found in Mossel Bay, South Africa (Item 4), and a section of an interior wall found on Rodrigues Island (Item 5). Given the ATSB’s confidence that the plane had crashed in the southern Indian Ocean at the start of the southern autumn near 36 degrees south, the researchers should have found marine life endemic to the temperate zone. But the scientists found no such thing. Instead, every single specimen they were able to identify was native to the tropical zone of the Indian Ocean. Like the flaperon, Item 5 came ashore with a healthy population of Lepas barnacles. And like those on the flaperon, these were found to be less than two months old. Particular puzzling was the assemblage of organisms found on No Step. Two-thirds of the species found on it live only close to shore and could not have been picked up in the open sea. “The natural habitat of the recovered molluscs is shallow water, on clean coral sand or in seagrass meadows,” the investigators reported. “None of them could or would ever attach to drifting debris.” The only way the investigators could make sense of this was to assume that it had picked up the shells of these creatures from the sand when it had come ashore. Only two specimens, a sea snail of the species Petaloconchus renisectus and a tube worm of the serpulid family, looked to be more than two months old. The former appeared to be six to eight months old; the latter, eight to twelve months old. Strangely, both types of animal are usually found living on the seabed rather than floating debris. Part of Réunion’s shore is rocky. It’s possible to imagine that “No Step” traveled westward from an impact zone in the eastern Indian Ocean, fetched up near Réunion, picked up the serpulid and the Petaloconchus, then drifting the rest of the way. But this still leaves question marks about the absence of temperate biofouling and the lack of organisms of the correct age. 31 January 2018: Today the Malaysian government released its first weekly report on the progress of Ocean Infinity’s seabed search for the wreckage of MH370, available here. It includes the chart shown above, which includes not only the Primary, Secondary, and Tertiary zones of the 25,000 square kilometer search area originally described in Malaysia’s announcement of the search (see below) but also supplementary areas that are collectively more than twice as large, and stretch far beyond Broken Ridge to 29 degrees south latitude. 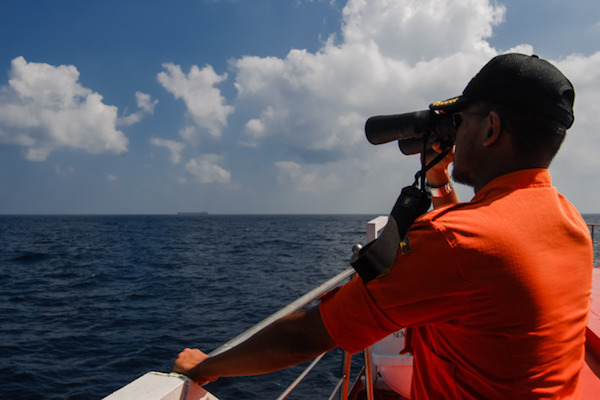 Before the release of this new report, Malaysia hadn’t signaled that it would be issuing updates on the search progress, let alone regular weekly ones, so its appearance is a welcome development. The report notes that that first section of the search, namely the outermost portion of the Primary Search Area, has been completed without finding any wreckage. 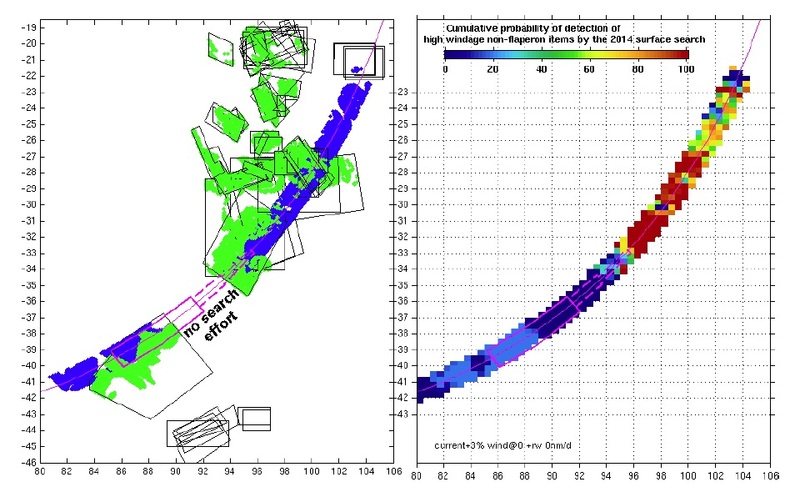 This section had previously been identified by Australian scientists as the most likely endpoint for MH370’s flight. As I write this, the scan of the innermost section of the Primary Search Area has been completed, but the assessment has not yet been released. However, the fact that Seabed Constructor has moved on to another area suggests that probably nothing was found there, either. A big caveat: we don’t really know how long it takes the search team to assess the data collected during each pass. 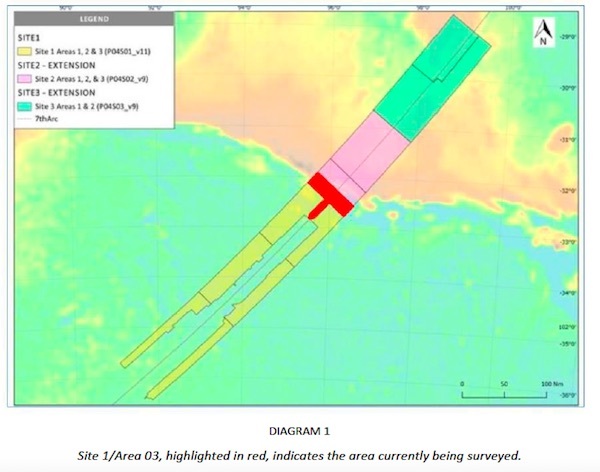 A failure to find any wreckage in the Primary Search Area would come as a disappointment to David Griffin and his team at Australia’s CSIRO, who delclared in a June, 2017 report that after analyzing satellite imagery and drift patterns “we think it is possible to identify a most-likely location of the aircraft, with unprecedented precision and certainty.” The report specified three target points, all located within the Primary Search Area. It does not fit with debris drift modeling. Wreckage which entered the sea at this latitude would have reached the western Indian Ocean too quickly. An endpoint this far north does not match analysis of the Inmarsat signals carried out by Australia’s DSTG. Left: Black rectangles show the extent of aerial searches in March, 2014. Right: Based on these searches officials calculate that wreckage from an impact between 29 deg S and 33 deg S almost certainly would have been spotted. PS: While I’m at it, here’s my latest theory for why Paul Marshall is being so secretive about backing the latest search for MH370: he and Anthony Clake are treasure hunters. They’ve salvaged historical wrecks for bullion in the past, and this suggests that their interest in MH370 is primarily for financial gain. Treasure hunters tend to be seen by marine archaeologists as plunderers, so they are used to negative press. I think that if Ocean Infinity is successful, then Marshall understands that it will be open to portrayal in the media as having profited from a tragedy. PPS: On Twitter Kevin Rupp (@LabratSR) has posted an image showing that Seabed Constructor is expected to arrive in Perth on February 8–that’s a week from Friday. Allowing for a few days’ transit time en route, there should be time for the ship to make some good progress into the Secondary Search Area before it departs on the 1200 nm trip. A London-based hedge fund millionaire is helping to finance the “final” search for the missing Malaysia Airlines aircraft which disappeared nearly four years‎ ago, in a bid to solve one of modern aviation’s greatest mysteries. Sky News has learnt that Anthony Clake, an executive at Marshall Wace Asset Management, is the key figure behind Ocean Infinity, the subsea exploration company which won the contract to hunt for the whereabouts of Flight MH370. ‎Mr Clake, who ‎oversees billions of pounds of clients’ money at Marshall Wace, is understood to have invested in Ocean Infinity after being impressed by its advanced technology. Mr Clake’s involvement ‎in the hunt for MH370 is restricted to a financing role at Ocean Infinity, and he has no day-to-day role in the operation. “Anthony Clake has made a private investment in Ocean Infinity and is one of a number of shareholders in the company,” the spokesman said. Color me suspicious. Clake works for Marshall Wace, which was founded by Paul Marshall, who is also the owner of two companies which each of a sole other board member apart from him: the two listed directors of Ocean Infinity. 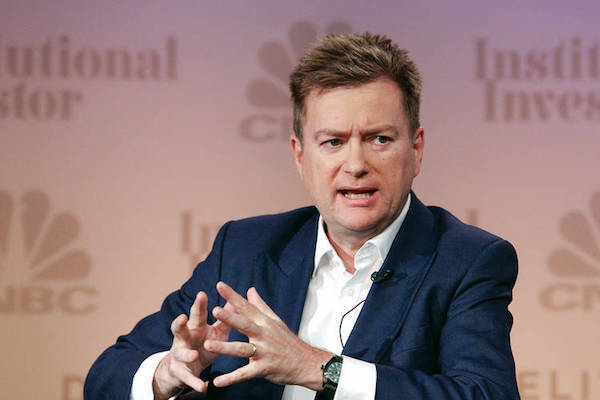 Clake is described as a millionaire; Marshall is the tenth richest hedge fund manager in Britain. This story doesn’t say that Clake isn’t the sold investor, but one of several. It seems increasingly inconceivable to me that Paul Marshall isn’t another, and probably main, one–notwithstanding the denial given to me by his publicist. As to why he’s being so secretive, I can’t begin to guess. Hedge fund managers Anthony Clake and Paul Marshall, a Liberal Democrat donor, told The Times they had invested in several shipwreck salvage companies, including some Robert Fraser firms, and in total had found 11 wrecks and a haul of silver. This much we know: Out in a remote stretch of the southern Indian Ocean, a 379-foot exploration ship called the Seabed Constructor has started searching an area that may be the final resting place of MH370, the Malaysia Airlines jet that vanished in 2014 with 239 souls aboard. 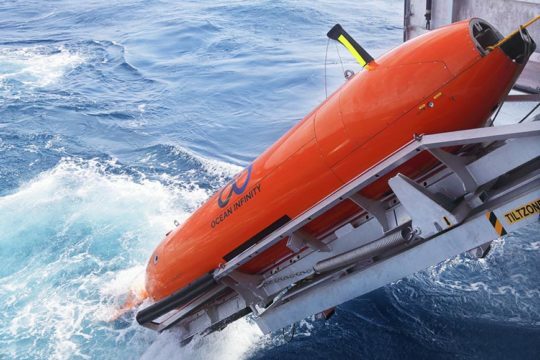 The ship arrived in the search zone on Sunday, and, given the rate at which the vessel’s swarm of eight autonomous subs can scan the seabed, could finish its work in as little as three weeks. Just about everything else about the project is shrouded in mystery, including who’s carrying it out and why. The search for MH370 was done and dusted as of last January, when Australia announced that its three-year, $150 million effort to scan 46,000 square miles of seabed had found no sign of the plane. The search zone had been demarcated by scientists using signals sent between the plane and a communications satellite after it disappeared from radar. The signals suggested that the plane turned south west of the Malacca Strait and flew in a straight line until it ran out of fuel, then nosedived into the sea. At the start of the search officials were so confident in their analysis that one boasted that they had a bottle of Moët “chilling nicely” — but once they were proven wrong, Australia seemed eager to close the case and move on. In a final report issued last October, officials lamented their failure to find the plane, a turn of events they labeled “almost inconceivable.” To explain the plane’s absence, officials surmised that something peculiar must have happened. Perhaps whoever was flying the plane descended and then flew in circles for a while before heading south. If that was the case, the plane could have ended up in a 25,000 square kilometer area to the north of the completed search area. But Malaysia, the country ultimately responsible for the search, didn’t feel confident enough in the idea to green light a continuation. Then last August a previously unknown company called Ocean Infinity stepped forward and offered to restart the search on its own dime, with payment only if it found the plane. The deal seemed to be a no-brainer for Malaysia, but negotiations dragged on until earlier this month. Under the terms of the final deal Malaysia will pay Ocean Infinity anywhere from $20 to $70 million, depending on how much seabed it has to search. This kind of deal is called “no cure — no pay” in the salvage business. Under this kind of arrangement a salvor might, for example, receive a portion of the crude oil recovered from a grounded tanker but get nothing if it fails to produce anything. The current situation falls far outside this model, of course. But given Malaysia’s sense that it had just wasted a lot of money on a pointless search, “no cure — no pay” might have been the only way for Ocean Infinity to lure them into a contract. It’s a high-risk gambit. The payout is not considerably large considering that the effort will likely cost tens of millions of dollars to mount. And the odds are long. Much of the new search zone was already scanned during an early phase of the first seabed search, before Australian scientists refined their calculations and moved their focus further south. In the highest-priority part of the new search zone, for instance, everything within 20 miles of the arc along which the plane sent its final satellite signal has already been searched and ruled out. It’s not clear how the plane could have flown further than that, since at that moment it was plummeting straight down toward the sea. Given the long odds, it’s striking that anyone would want to roll the dice. Some have speculated that the effort is essentially an act of charity by deep-pocketed philanthropists. But it would seem strange for do-gooders to keep their operation shrouded in as much secrecy as the group behind the Seabed Constructor has — basically we know nothing about it. Another possibility is that the backers’ ultimate motive is to garner publicity for Ocean Infinity so that it can win contracts in the undersea-exploration industry. There are two flaws in this theory though: this industry is in a severe slump right now, with few jobs available; and, it’s a sector where capabilities and price, not branding and exposure, are the key to gaining customers. A third explanation is that the backers don’t think their odds of finding the plane are long — either because they are clueless or because they possess some information that the rest of us don’t. Or perhaps there is something else going on that we could never guess from the outside. That’s entirely possible, too — if a little unnerving. 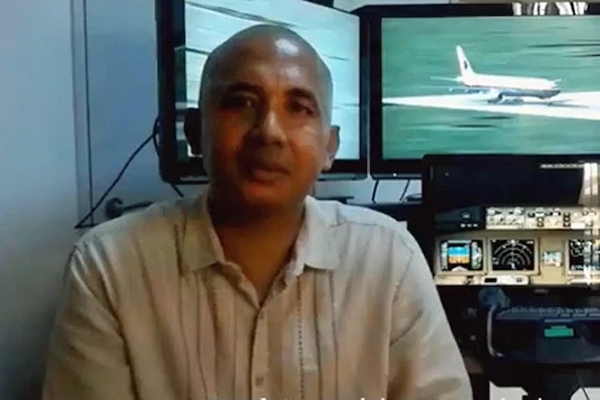 The saga of MH370 is full of unanswered questions, and this is another one. Ocean Infinity was registered in Delaware on June 9, 2017, and in Texas 21 days later. It leases Seabed Constructor from Swire Seabed, a subsidiary of the London-based Swire Group conglomerate, and employs a Louisiana company to operate the swarm of undersea robots that will scan the seabed. The company’s Texas filing lists its directors as Oliver Plunkett, 45, and Ross Hyett, 64. Both men are based in London and work in the wealth-management field, finding investments for high-net-worth clients. Each serves on the board of a private company owned by Paul Roderick Clucas Marshall, a British hedge-fund manager worth an estimated $683 million. Marshall has long been active in the Liberal Democrats party (and is the father of Mumford & Sons member Winston Marshall). Marshall’s publicist denies that he is behind Ocean Infinity, however. As the story unfolds new strange angles continue to emerge. 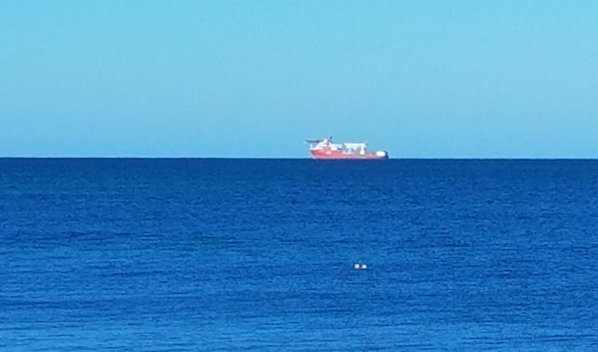 With Seabed Constructor approaching the search zone last weekend, users of a ship-tracking site noticed that another vessel, the 312-foot Maersk Mariner, had left the Australian port of Fremantle in western Australia and was heading for a rendezvous. The Mariner is a so-called anchor-handling vessel designed to support offshore oil drilling. The purpose of its current mission is so far unclear. As with everything else, Ocean Infinity is staying tight-lipped. The company releases official statements only infrequently, apparently preferring to communicate via leaks to a small number of journalists and independent researchers who will occasionally drop a tidbit on Twitter or personal web sites. Some of these people claim to have been told the nature of the project’s funding off the record, and refuse to divulge it; others say they have chosen not to ask. This, unfortunately, is par for the course for the shadowy saga of MH370. If the vanishing of 239 passengers and crew is a profoundly discomfiting eventuality, so too is the years-long bungling by search officials, and the chronic inability of the world’s journalists and investigators to press for satisfying answers. Given the strangeness of the mission and the consensual fog that lies over it, it’s frankly hard to know what to make of Ocean Infinity’s mission. But this state of uncertainty can’t go on forever. Malaysia has given the company a hard deadline of 90 days to wrap the project up. By then we should either have achieved some clarity, or another strange chapter of this saga will have been wrapped up and shipped off to cold storage. At so that, belatedly, will be that. When they wrote their report delineating the new 25,000 square kilometer search zone, Australian scientists wrote that if the plane is not found in this area they have no other ideas about where to look. No theories about what happened, no explanation as to why — they’ll just have to close their files once more and shrug, as baffled as when they began. UPDATE 1/12: I don’t like to substantially change a piece after I put it up, and don’t think I have done so before, because it feels like rewriting history, but in this case I have heavily revised this piece to reflect the fact that most of my concerns about the Economist piece were either fixed or were rendered moot by subsequent events, and leaving it up in its original form was causing psychic trauma for the author of the Economist piece, Hal Hodson. Whether or not Ocean Infinity was sincere about its claim that it would carry out the search without a contract, the contract has been signed, and so the road to a second seabed search is open. It’s important that the world not overlook the fact that things are vanishing without a trace at an accelerating pace. In 2016, an Antonov An-32 belonging to the Indian Air Force disappeared over the Bay of Bengal; less than two months ago, the Argentinian sub San Juan went missing during a training exercise. We should perhaps try to figure out what made these things happen before getting too smug about them not happening again. UPDATE 1/2: Shortly after I posted the above, the ship headed out to sea and is currently (21:49 GMT, 2 Jan 2018) on a heading of 147. I’ll seek clarification from Mark Antelme about the discrepancy between what he told me and what Plunkett apparently told the Economist. If Seabed Constructor looks for the plane in the designated search area and fails to find it, that will be due to the fact that the plane is not in the designated search area, not because the technology is lacking in some way. Indeed, as I’ve written in earlier posts, there are many good reasons to doubt that the designated search area is correct. In other words, the company is clearly signaling that it will NOT conduct the seabed search until it has the contract nailed down with Malaysia. However, it apparently is going to position the ship so that it can be in place in the event that that happens. This makes sense from the perspective of wanting to make the most of a limited search season, but it would seem a rather terrible strategy from a negotiating perspective. Leasing the ship and crew and getting it into position means an outlay of a significant amount of money, so by the time they arrive on station the company will have a strong incentive not to walk away from the table, no matter what terms Malaysia offers. Of course, all of this is academic if the airplane is not in the search area, since in that case Ocean Infinity would not get paid anyway. 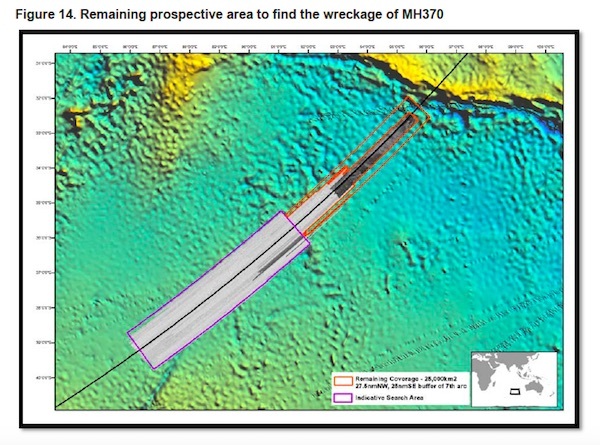 An analysis conducted by Australian scientists during the official seabed search calculated that there was effectively a zero percent chance that the plane could have come to rest where the planned search is going to focus. UPDATE 3: [3 Jan 2018, 10:00 GMT] The Economist’s story has escaped into the broader media ecosystem, with a number of mainstream publications, including The Guardian, picking up a story by the Australian Associated Press which states that “the search for MH370 is back on with the ship Seabed Constructor sailing from Durban today for the search area.” Perth Now has its own story. Both seem to be repeating the Economist’s claim without having done any additional reporting. A check of Marine Traffic shows that Seabed Constructor has spent the last nine hours holding position 30 nautical miles off the coast of South Africa. Since I’ve identified a number of inaccuracies in the original article, let me restate what is the core issue here. A lot of people have been waiting a long time for Ocean Infinity to sign the contract with Malaysia and officially restart the search. The Economist is reporting that both of these things have happened. Ocean Infinity’s spokesman tells me that they have not. Indeed, I find it hard to believe that either of these things could have happened without either Ocean Infinity or the Malaysian government releasing a statement. Thus, the Economist has reported a major development that appears not to have occurred. There are three basic ways to fly a Boeing 777. The first is traditional hand-flying: manipulating the yoke to change pitch and bank. This is a fun way to fly a plane in a simulator, but in practice, pilots don’t do this in commercial jets at altitude because it is inefficient and requires too much attention. Which leads us to the second way to fly the plane: by using the autopilot to fly from waypoint to waypoint. This is called LNAV, for lateral navigation, and is the way that pilots generally fly commercial routes. The path from airport to airport consists of a series of such waypoints, which the pilots plug into the flight management computer so the plane can fly itself. The third way is to use the autopilot, but in a different way. By selecting HDG (heading) or TRK (track) hold, pilots can aim the plane in a certain direction and let it fly straight. 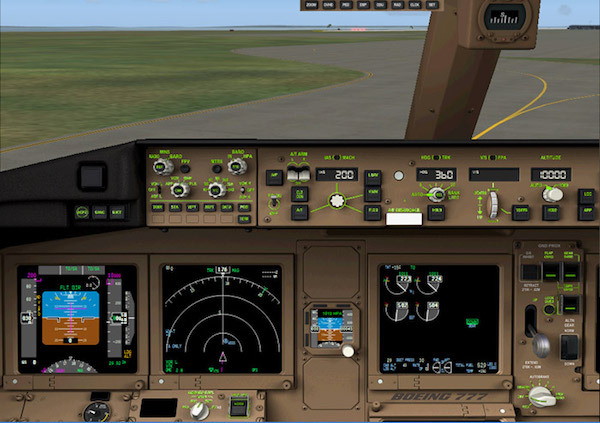 You can use any of these in Microsoft Flight Simulator 2004, the program that MH370 captain Zaharie Ahmad Shah use to practice flying a 777 five weeks before the plane disappeared. You can also use a fourth. By opening the map display panel, you can use your mouse to physically drage the plane to a new location. Looking at the data recovered from Zaharie Shah’s flight simulator, it seems that he used at least three and possibly all four of these techniques during his session that ended with the plane above the southern Indian Ocean with no fuel. — At point 3N, the plane is close to airway R467, with a heading that is close to what would be required to reach the next waypoint. It’s possible that at this point he was flying the plane using LNAV. — Between 5N and 10N, the variable which records the maximum G force that the plane has experienced jumps from 1.4 to 2.2, and the minimum G force descreases from 0.6 to 0.1. These are accelerations that will never be experienced by a plane flying on autopilot, so we can infer that Shah was hand-flying the plane. — At point 10N the plane is located is 13 nautical miles from airway N877 on a heading of 255.5. It’s been suggested that the plane could have reached this point if it were flying along that airway, and then the active waypoint were changed from DOTEN to a point somewhere in the south. However I have run the simulation in a Boeing PSS 777-200LR and found that if that manoever is performed the plane will enter a left bank of 20 degrees (as observed) and achieve a heading of 255.5 about 6 nautical miles from the airway. It seems impossible, then, that the plane could have been flying along airway N877, and since there is no other route it could have been turning away from, I assume that Shah was flying in HDG or TRK mode, which also make turns by putting the plane in a 20-degree bank. — Between 10N and 45N, the plane moved a distance that is not commensurate with the quantity of fuel burned. The only plausible explanation is that the plane was moved on the simulator’s map display. The upshot of all of this is that the recovered flight simulator data tells us that Zaharie Shah did not practice flying a 777 to fuel exhaustion in the southern Indian Ocean on autopilot. Instead, he moved the plane manually to the southern Indian Ocean, altered the setting of the fuel load to zero, and then hand-flew a gliding descent. Given this understanding, the flight simulator session shows significantly less similarity to the accident scenario than was originally believed. Could its uncannily resemblance to MH370’s eventual disappearance be merely a coincidence? A hallmark of a coincidence is that it’s an outlier, with no other similar or corroborating evidence. And that’s exactly the situation here. Nothing else found on Shah’s computer, or uncovered by the Royal Malaysian Police investigation into his personal or professional life, suggests his guilt. As a piece of evidence, the simulator data looks shaky, and all the more so the closer you inspect it. Posted on November 21, 2017 December 1, 2017 Author Jeff WiseCategories Aviation65 Comments on Does the MH370 Captain’s Flight Simulator Prove His Guilt?